What if Hatchlings ruled Pyrria? Since Arkhor's new clutch, I've been thinking, what if your dragon was a hatchling? It's simple. Your dragon has the exact same roles in the tribe, the only difference is that they're all hatchlings. They have hatchling personalities and appearance. Shine no longer has the tear in her fin from Dusk, and she's not a mopey wreck from losing her mate. So, you are a hatchling but have all the same roles and responsibilities as your full grown dragon! Enjoy! Location : Mourning the loss of my Mate. Re: What if Hatchlings ruled Pyrria? Solstice was a very light dragon, and sports weren't her strong suit. She gripped the vine in her mouth, at the back of it, where teeth weren't as sharp. She let her laws loose and began to climb up, her claws assisting a bit, but they didn't even have to go into the bark. She reached the top and spit the vine out, shaking the disgusting yet satisfying taste from her maw. "Okay, what now?" 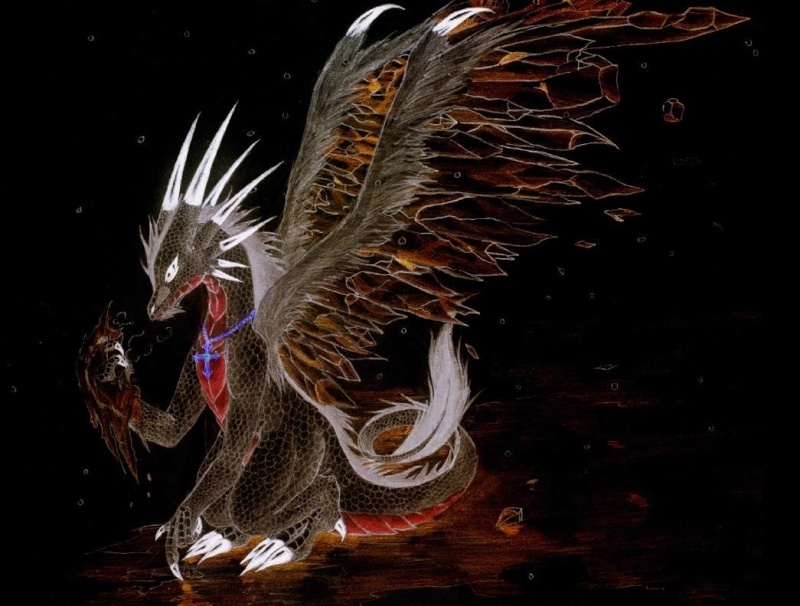 Prototype picture of Arcke by Shiningwater! Thank you for drawing Arcke-Kun! And the star of the show... LEATHER PANTS!!! Titles - "Last Standing SkyWing of 2014"
A very small blue-silver dragon approached the SeaWings healer. "Shine?!" He asked her, noticing she was tiny. "What's happening?". He asked confused. He playfully slapped her face with his tail, sticking out his tongue at her. Than he ran away laughing, attempting to jump inside a water pool to hide from her. Solstice nodded and smiled at the dragoness. "Hello, person! I'm Solstice, who are you?" She asked and jumped off with her wings spread, causing her to catch the breeze. She gasped and angled her wings downwards, just enough so that she could skid over the lake. She then cried out, laughing despite the pain, as she fell onto frozen water. "Well... I'm shaken up.. but I can fly!" She chirped. 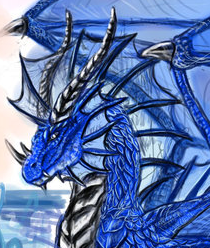 Shine looked at the deep blue dragon, her eyes wide and nervous. "How'd you know my name?" She squeaked, ducking under the water slightly. Then she turned to the other female. "Shiningwater, but you can call me Shine." She cast another nervous look at the male. "But how he knew that is weird." As she spoke, the female got airborne, and Shine ducked as she struggled to retain height, and flew low over her head before hitting the ice and skittering over it for a few seconds. She poked her head above the water again and her gaze immediately grew concerned. "Are you OK?" Solstice grabbed him by his tail in between her teeth, with such a gentle embrace and such that was almost motherly. "Be careful, okay?" She said through a mouth full of tail, as she carefully dragged him closer up to the dry area. "Thank you for saving me, but I could have gotten over here without you almost drowning. And yeah, I am!" She cried to Shine. "Oh, well, hi, Arcke. It's so nice to meet you all! Omigod, we should start a little group! We can work things out together!" She cried excitedly, looking at Shine and Akr. She bounced excitedly, closing her eyes as snow fell around her. This was fun. Solstice looked at Ark, wondering how he could stand the 0- F temperature of her aura. "Shine, what do you think? Oh, maybe we can call it the Element Club! Even though we're different, doesn't mean we can't be friends!" She cried, smiling widely at the two. The icy blue dragoness nodded, looking at the two. "That'd be so cool! We can be best friends!" She cried. Despite the fact that she was disobeying her mother, she felt quite happy. Besides, her mother couldn't be mad if she was staying safe and learning new things, along with making friends, right? "I don't know. What do you think, Shine?" She asked, tilting her head to the side. Frostflare hollered from the tall trees that towared(did I spell that right?) above the rest of the hatchlings. "HEY! I wanna join too! Don't leave me out of the fun!" She then jumped down and landed on the ground, almost losing her ballance. Here is how I am when I am happy. Here is how I am when I am murderous. Now how do you feel?I bet it is like this. So , who wants to party? I'm sure that it will bring you to your grave. You really want to see the demon inside? Atlantis hided behing a rock, sure that Shine won't find him. He waited for a while, but she wasn't arriving. Atlas thought his refuge was indeed too much hard to discover. So he decided to went out and look for Shine. The water was slightly frozen on the surface. That was strange. His eyes sparkled when he noticed Shine's tail in the water. It was irresistibile to not attack it. He snapped at her tail with his tiny fangs (they're too small to hurt), attempting to drag Shine in the water. "Come here and play!" He joyfully growled. Atlas was between the most playful pups you would find around. Solstice looked at the hatchling. "Who are you, though?" She asked curiously. The little icy blue dragoness giggled as a hatchling dragged Shine from the water. Solstice quickly trotted over to the little hatchling female, by which was known as "Frostflare." "So, what's your name?" Frostflare looked at the other icewing. "I am Frostflare, you can call me Frost, Flare, or even Frosteh." She excitedly told the new dragons while pratically bouncing up and down.